Dr. Jeffrey Karlik is one of the busiest and most experienced LASIK surgeons in Western Pennsylvania. 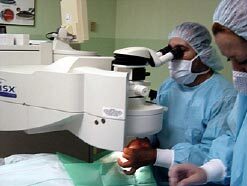 He has performed LASIK since 1999 and has performed over 10,000 vision corrective surgeries. He has experience performing a high volume of cases using three different laser systems. 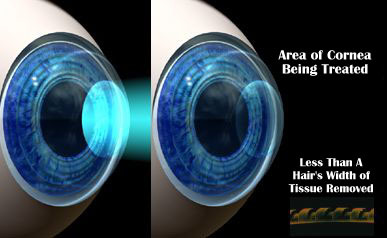 LASIK is an acronym for LASer In-situ Keratomileusis, which simply means "to shape the cornea by using a laser". It corrects vision by reshaping the cornea (outer window of the eye) so that light rays focus more precisely on the retina, thereby reducing or eliminating refractive errors (nearsightedness, farsightedness, or astigmatism). You will arrive at the laser center about an hour prior to your procedure. Once you have been checked in you may be offered a sedative to help you relax. You will then be prepared for surgery. Anesthetic eye drops will be used to numb your eyes; no injections or needles will be used. When your eye is completely numb, an eyelid holder will be placed between your eyelids to keep you from blinking during the procedure. A sterile drape will then be applied around your eye. Next, an instrument called a microkeratome will create a hinged flap of thin corneal tissue. During this process, you may feel a little pressure, but no pain. It is expected that your vision will darken or "fade-out" at this time of the procedure. It is an indication the procedure is proceeding as expected. The pressure will then ease and vision will slowly return. Dr. Karlik will then gently fold the flap out of the way. Your vision will blur slightly at this time. You will then be asked to look directly at a target light while the laser reshapes your cornea. The Excimer laser will be programmed with the information gathered in your pre-operative exam. The laser treatment will be completed in less than a minute or two, depending on the amount of correction needed. To finish the procedure, the protective layer will be folded back into place where it will bond without the need for stitches. Following your procedure, your eye(s) will be examined with a slit lamp microscope. Then you will be given additional eye drops and your eyes may be shielded for protection. Your vision will probably be a little blurry at first, so someone will need to drive you home. You should relax for the rest of the day. You may experience some discomfort for 12 to 24 hours, but this is usually alleviated with an over-the-counter pain reliever. Some people experience sensitivity to light and watering or swelling of their eyes for a few days following their procedure. You will be asked to come back the next day for another examination of your eye(s). Most people can actually see well enough to drive the next day but it is best not to drive until you have been examined. You should be able to resume your normal activities the day after surgery. 1. Corneal tissue flap is created. 2. Excimer Laser reshapes cornea. The decision to have LASIK is an important one that only you can make. The goal of any refractive surgical procedure is to reduce your dependence on corrective lenses (eyeglasses or contact lenses). However, we cannot guarantee you will have the results you desire. Nearly all Dr. Karlik's patients are extremely happy with their vision after LASIK and can do most activities without dependence on corrective lenses. 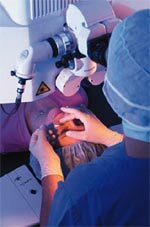 Serious complications with LASIK are extremely rare. LASIK is a safe, effective and permanent procedure, but like any surgical procedure, it does have some risks. Many of the risks and complications associated with this procedure can be reduced or eliminated through careful patient selection and thorough pre-operative testing using the latest diagnostic technology. After LASIK, you may experience some visual side effects. These visual side effects are usually mild and diminish over time. But there is a slight chance that some of these side effects will not go away completely, such as feelings of dryness, glare and halos. Since everyone heals somewhat differently, some patients may overreact to the procedure and some may underreact resulting in over corrections and under corrections. Once the eye has stabilized (3 to 6 months) you and your doctor can discuss whether a re-treatment (sometimes termed an enhancement) could help fine tune your vision if you are over or under corrected. After a thorough eye exam, you and your doctor will determine if LASIK is an option for you. If you are a good candidate, you will be given additional information about the procedure that will allow you to make an informed decision about whether to proceed. Be sure you have all your questions answered to your satisfaction. Some patients with thinner corneas, high prescriptions, certain occupations, or certain eye conditions may not be candidates for LASIK. For these patients photorefractive keratectomy (PRK) may be the best option. With PRK, the front surface is prepared by cleaning the front corneal surface free of cells before applying the laser treatment. Following this, the laser is used to reshape the cornea. Dr. Karlik often uses a medication called mitomycin to modulate the healing of the cornea and reduce the incidence of corneal haze or scarring. A bandage contact is worn afterwards for the first few days to allow healing of the surface. Vision improves several days after surgery once the surface cells have had some time to heal and recover after PRK. PRK uses the exact same laser as used with LASIK. The ultimate results of LASIK and PRK are essentially identical. The difference between the two procedures is primarily the post-operative recovery time. If appropriate, the doctors at Karlik Ophthalmology with discuss the option of PRK with you. LASIK technology is constantly changing and improving. Dr. Karlik's affiliation with the LASIK Vision Institute in Pittsburgh insures the latest technology will always be available to Dr. Karlik's refractive surgery patients. The LASIK Vision Institute has recently upgraded to the WaveLight Ex 500 Excimer Laser.